This article is a translation of an original article of the German Uncyclopedia. If this sort of humour does not appeal to you, this might be intended, or lack of humour on your side, or (improbably) due to an imperfect translation. Cheers. The novel Travel Guide For All Countries is also available in paperback. The longing for distant places is as old as mankind. Even when we know that other people long to be where we are now. "Traveling improves your education", as Edward John Smith, captain of the Titanic, always said. For this reason, people who travel are mostly uneducated, and that's a good thing. For all their education, the traveller should never forget that a journey is not only for intellectual edification, it is for also recreation, alcohol abuse in the southern sun and uninhibited debauchery. For a vacational trip, numerous countries near and far are available today. 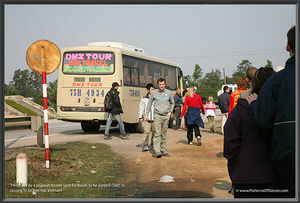 It is a good idea for every tourist to read up on his destination beforehand in order to avoid popular mistakes. Every bookshop offers yards and yards of bookshelves packed with travel guides. These books often shine with colorful photographs, but they have one critical fault: they deal with one region or country only. The UnBook at hand, however, is a travel guide you can use for every trip. All standard travel guides can be considered obsolete with the publishing of the Travel Guide For All Countries. You might regret this, but technical progress covers every sector today, and travel literature as well. One day in the future, when vacational trips beyond our planet are possible and feasible, publishing other travel guides might be justified again. A journey does not really need planning, but one important preparation must be started some weeks before departure: visiting a solarium and getting a proper tan. The deep golden tan expected of every returning vacationer today can hardly be achieved just by staying in the sun. Moreover, you can never be sure about the weather at your destination. Of course, you can continue to visit solariums abroad as well. To start out with a proper tan has even more benefits. Fellow travellers will recognize you as a holiday professional. You can look down on your pale compatriots and you will not be recognized as a newcomer at your destination. This will save you from unwanted attention of time-share pushers who jump at every pale newcomer like a flock of vultures. Better bring another suitcase than risk forgetting something important! If you prefer to travel lightly, you can bring this simple but universal equipment, of course. A journey will lead you into unforeseeable situations. To ensure you are properly dressed and styled for every occasion, you have only one option: bring everything. Even better, do not only bring every piece of clothing you already own, but go shopping before the journey and get your outfit up to date. You, the traveller, are representing your country and your cultural background abroad! Therefore, the fashion race has to continue during your vacation as well. 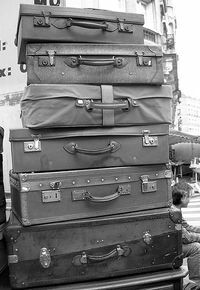 Of course, the journey will allow you even more shopping, so better bring some extra suitcases, too. Money is a fantastic invention and will be accepted anywhere in the world. Take some along as a matter of course, like toothpaste and suntan lotion. As with suntan lotion, money is best in the highest figures. When selecting your photo and video equipment, consider this: You are spending a lot of money on your journey (more money than you can actually afford, truth be told), and every major expense also has to generate envy and admiration in your fellow man, otherwise it is somewhat pointless. Since you cannot take your neighbours, coworkers and friends along, you have to bring evidence home so there is something to show. Apart from a proper sunburn and tasteless souvenirs, photographs and videos are the best proof of your extravagance. Therefore, at any point during your journey, imagine your amazed friends and acquaintances staring in wonder at the pictures you have taken. Your finger has to be ready at the camera trigger any time, so that the most impressive moments ("Gladys steps out of the bus") are not lost for eternity. These moments have to be relived over and over again in your presentations. Live audio commentary is generally considered most professional ("Now, Gladys steps out of the bus"). This marvellous composition is a prime example of a holiday picture spontaneously taken, but masterfully composed. A harmonious relation of nature, people, architecture and technology, an interesting choice of theme, and overwhelming symbolism combine into an all-embracing masterpiece of the photographic art. When taking pictures of people (which unfortunately cannot be totally avoided) you should ask people to freeze, to stop every sort of motion, even breathing. Pictures will appear particularly natural then, because they are not blurred by any sort of motion and because it is easier to focus on the right detail. If people refuse to smile (this might start to occur after a dozen attempts or more), you should not hesitate to discipline them. Being on vacation does not mean that people should be allowed to unduly relax. There are numerous types of insurance on offer to travellers. The best option is always to buy a freshly printed sheet of paper from the nameless counter found at all airports. This gives you a feeling of security, the more cash you forked out for it the better. If any real emergencies occur abroad, they are best handled by the local embassy of your country, or by a spiritual guide of your choice anyway. One thing to keep in mind is that your relatives would not want to be burdened with arranging the transport and burial of your earthly remains, in case you chose a cheap stagecoach with an overtired driver who heads directly into a steep chasm next to the road - or a plane with a no-frills airline that missed the last service appointment and is piloted by a rookie, to similar effect. Some people travel in order to improve their health, and recover from sicknesses and ailments, or at least to forget about them for a while. Foreign countries can have a healing effect, and they offer new and exotic sicknesses and ailments in return. You can even take them home as souvenirs. Don't bother trying to prevent these diseases with injections before you travel - the medical staff at your local doctor's surgery are not qualified to deal with this properly anyway. A better plan is to ask for specialists, healers and medicine men on location. They will be glad to introduce you to the authentic folk medicine of your host country, for an appropriate fee. If for any reason that does not work out, take your newly acquired Ebola virus home, dodge customs and quarantine and have an overtime holiday at the specialized hospital of your choice. Traveling with children is easy. By day, keep them quiet with an mp3 player, Nintendo DS or Gameboy, at night you can immobilise them with mild sedatives or just tie them to the bed, so that they do not disturb the proper flow of your vacation and you can eat out with friends in peace. Alternatively, a vacation trip can be utilised to sire children. A journey by car guarantees an eventful vacation from day 1. 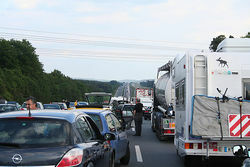 Traveling by car is one of the most convenient and comfortable ways to move. With the car, you take a part of home with you into the unknown. A car is an ideal place to stow baggage and valuables, and you have the opportunity to test your driving skills, to compete with locals and to take part confidently in the traffic events. Local drivers will frequently and gladly benefit from demonstrations of your superior driving skills. If you are married or otherwise burdened with a partner, a journey in a car is an excellent occasion to test and train your teamwork and communication skills. Leave your GPS navigation system at home or switched off and hand a map to your partner. Head into an unknown city and then start bugging your co-driver with questions like "where now? ", and keep him or her busy with encouragements like "come on!" if their reactions are too slow. If this results in you missing the correct turnoff, don't hesitate to blame everything on your partner, since you are busy dealing with the traffic. All that is an interesting test for your relationship. If the test fails, you might want to make your next trip alone or with the nice automated voice of your GPS navigation system - she at least knows her way. Traveling by plane, of all conveyances, is most eventful by far. From the moment you enter a terminal, you will enjoy being treated in a manner usually reserved for Rock Stars or dangerous criminals. You will be searched thoroughly; hand luggage and shoes will be confiscated; hair samples and fingerprints will be collected; salivating drug sniffer dogs will lick your toes; your birth certificate and paycheck will be faxed to American homeland security (even though you are just going to fly from Paris to Crete); heart pacemakers and candies in your pockets will be rendered useless by oversized microwave devices; and your friends and relatives will all be interrogated - by telephone if necessary. All this happens before you finally are allowed to pass a line of overarmed and underpaid guards and enter the waiting area, where you will spend the next six hours until your plane departs. Smart criminals will therefore buy their drugs and weapons only after the security check, in the duty free zone (often from the guards). Watch out for discounts! Sea voyages are a fantastic invention, because they allow you to travel foreign lands without ever setting foot on them. Only a home video session could be more comfortable. With a ship, you even can make a trip without a destination, a so-called cruise. A cruise means to crisscross erratically between several places, which means you can without interruption pursue the real points of traveling, which are of course gluttony, carousing, cultivating an impressive sunburn and acquiring assorted STDs, not necessarily in that order. Bicycles are the means of travel for people who wholeheartedly love to be exposed to the weather of their destination. Flat, coastal areas are not only most convenient for cycling because of their low gradients, but they also offer the most diverse experiences of wind and rain, and therefore the highest event value for your travel money. As already mentioned in the insurance section, a bus is a cheap and flexible means of transportation. Bus passengers enjoy close contact to their fellow travellers, and the variety of germs in the on-board toilets will brush up your body's defenses. Watching the street signs through the window widens your horizon and makes the journey to your destination an unforgettable experience. Please keep in mind to get an appointment with your orthopaedist for soon after your trip. Make sure he collects all necessary data for a successful lawsuit against the bus trip organiser for arthritis, rheumatic ailments and other afflictions associated with bus traveling. Traveling on foot (also called hiking by adherents of this bizarre way of movement) is, contrary to widespread opinion, possible, though asinine. Nature has given man two feet: one for the accelerator and one for the brake pedal. Do not undervalue these gifts. To choose a destination for a journey is not absolutely necessary in our modern days. You might as well pick at random the first last-minute offer at the airport, or blindfold yourself and point to an area of a globe at random. In any case, in the first city you hit you will find the usual franchise shops with all sorts of everyday essentials and tourist merchandise. Foreign people often have strange customs. Of course you always can take pictures, but be prepared for anything. For example, bring an umbrella in case it's a rain dance. Locals. Locals occur in every inhabited place, therefore it is difficult to avoid them. They are easy to recognize by their slightly irritated facial expression, which arises from the fact that they have to work or earn their living in another way while it's actually vacation time. Tourists. Every place worth visiting is visited by tourists today, therefore it is difficult to avoid them. They are easy to recognize by their slightly irritated facial expression, which arises from the fact that in their vacation, of all places, they have run into a tourist area. Apart from tourists and locals, you can also meet really interesting people - people who deal with tourists on a professional basis, for example: travel guides; entertainers; holiday representatives; receptionists and flight attendants. These people are solely dedicated to fulfilling the needs of travellers, so you should keep them busy with questions, demands and special requests. Climate can be found in most parts of the earth. This is due to the popular American phenomenon of climate change, which in turn is caused by numerous climate control units. Come on, just follow the crowd. Someone among them will know the way to the next cathedral, bar or vista. Some countries also have begun to put signs showing a camera in certain places, so everyone knows when to take a picture and of what. Buildings that do not look like the others are objects of interest in most cases, so photograph them just in case. Mountains also are popular themes. Watch out - if many people and/or birds are walking around the mountain it might actually be a garbage dump. Better buy your souvenirs later. Sometimes, communication with other people cannot be avoided when traveling. If the other person is a tourist, too, communication is rather easy, because you can assume that the other person's intentions are quite similar to your own. You should be able to communicate simple requirements such as asking them to take a picture of you with appropriate gestures and grins, even if they don't speak your language. But if the other person is a local (see above), communication can be difficult. Many locals in many parts of the world stubbornly refuse to learn proper English, or any other languages that a civilized tourist might learn in school. In such a situation, apart from gestures and facial expressions, the traveller should resort to his natural authority and the volume of his voice. In many cases, the locals just lack the proper incentive to understand the concerns of the traveller - a resolute attitude can break this spell and return quick results. In very rare cases, it may occur that the traveller is addressed himself by locals. Of course, you should try to avoid this sort of situation at all costs, but if this is not possible, reply in a clear and articulate way in your own native language. This lets the local know that he should improve his language skills if he wishes to receive guests in his country. In order to find adequate lodging, you should look for the stars. This does not require knowledge of astronomy. You just need to count the number of stars next to the door of a hotel. This does require knowledge of counting. 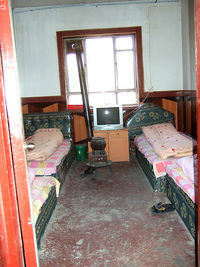 A room in a one star hotel normally possesses four walls. Rooms in a two star hotel are equipped with furniture, if you are lucky. On weekends there is also some staff who burn the furniture and remove insects, vomit, and drunkards from the room using a high pressure cleaner. Typical, cosy room in a three star hotel. Middle class, the room always will have a TV set so you can watch a flickering transmission of a bizarre local sports event or an exciting talk show in the local language. There are maids who can be persuaded with hard cash to select the least filthy bedclothes for the esteemed guest. Elegant furnishing in the rustbelt baroque style of the local cultural area. If you follow the rumbling and hissing sounds and you are lucky, you might find the minibar and can get drunk on 0.05 pints of what passes for beer in the area. Numerous, very committed employees run around. They all resemble each other a bit, since that sort of job is much sought after and therefore brokered to relatives in most cases. As you can expect from so many stars, prices are astronomic now, but it is worthwhile: Confectioners and comic artists have been employed as decorators, an army of staff fills the corridors in gilded fantasy uniforms. The esteemed guest is kindly asked to leave his credit card at the reception for the duration of the stay. Bring a second one for shopping. 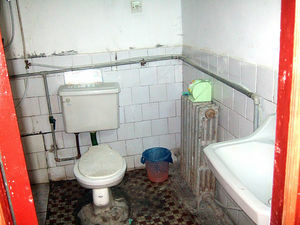 A civilized standard of sanitary equipment can be expected everywhere in the world today. The so-called "all inclusive" accommodation is very popular and should always be chosen if possible. It means that you are busy eating and drinking 24 hours a day. This discharges you from the responsibility to make plans for any other sort of activity. Before starting such a trip, make sure you sleep ahead at home, so that the time for eating and boozing is not unnecessarily reduced by the need for sleep. Checking your liver data up front, or undergoing a concentrated booze training regime are also useful. The all inclusive traveller is normally marked with a decorative, non-removable coloured plastic wristband. This increases the feeling of togetherness and also simplifies identification in case of occasional fatalities/loss of limbs. The traveller only needs to keep in mind some basic rules and tricks in order to dine well for a reasonable price. For dining, it is best to visit a town quarter that specializes in meeting the needs of travellers. Normally, this is a beach esplanade or a plaza next to a place of interest, i.e. a cathedral. Here the traveller has the best selection of reasonably-priced restaurants with friendly service and fine food. Restaurants which advertise their food in colourful, backlit pictures, show that they are especially equipped for the needs of foreigners and illiterates. Here the traveller can expect to find familiar food instead of undefined, unhealthy local fare. If the pictures of the food are already very faded, you can be sure that the innkeeper has managed the place for a long time with great success, but not quite enough to afford new signs. Places that are avoided by locals should be preferred by the traveller for this very reason - you can expect that the service and quality meets international standards and not the lower requirements of the local community. If a restaurant is absolutely deserted, this is a sure sign that it is an exclusive place of highest quality and finest food, or an insider's tip which should be checked out by all means. If a tourist is approached clamorously and obtrusively by an employee of a restaurant, courtesy demands that you follow the invitation of the friendly host and take a meal at his place. This also applies if you had your fill at the restaurant next door just a minute before. The author is an enthusiastic tourist. This page was last edited on 2 December 2014, at 04:18.